No matter where you’re heading to, extra space for your cargo is never a bad idea. Oftentimes, the simplest way to increase available storage is to utilize space on the roof of your vehicle. Using a rooftop cargo bag is the very thing that can hold your luggage, camping gear, and more with ease. Cargo bags are less expensive than hard cargo roof boxes. They can also be easier to mount and fit bulky items that may not lay flat in a box. These bags vary quite a bit in quality, size, materials, and more. We’ve done thorough research to find the very best rooftop cargo bags on the market today. One of the least exciting parts of travel is figuring out where to put everything. Rooftop cargo bags make it a whole lot easier. Not every cargo bag is going to suit every person. That’s why we’ve decided to write the buying guide below. It will ensure that you make the proper selection, and will end up happy with your purchase! This is probably the first factor you should look at when selecting your new roof bag. How much equipment are you planning on storing in there? What are you planning on storing? Once you figure that out, you can start narrowing down your options. Think about if you’re going to be taking odd-shaped items with you. If so, then consider a bag that can accommodate its shape. Make sure you realize that the capacity is generally measured in cubic feet, so you have an idea of the limitations of the bag. 15 cubic feet is a pretty standard carrying capacity among the products we have reviewed. The materials used in your prospective rooftop cargo bag is crucial. After all, it’s going to be exposed to sun, wind, bugs, dirt, and quite possibly rain and snow. The material has to be one that’s going to stand up to all of these situations. Keep in mind that most manufacturers are going to use the word “waterproof” in their marketing, but not all of them are completely waterproof so much as water-resistant. This will be sufficient for most rainfall situations. But if you have some heavy rain pouring down on you, you may end up with some wet equipment. There are some bags listed here that will keep your gear dry, regardless of this, however. As most will have zipper closures, look for a model that has a fabric flap or Velcro which can cover it to keep water out. Generally speaking, we found that synthetic materials are typically much better at withstanding rain and holding up in the elements than natural ones. In addition, if the fabric is coated with PVC, that’s also going to help with waterproofing the bag. This kind of goes along with our last point, but try to select the most durable soft carrier you can. Generally, you’ll find that the bag itself is pretty sturdy. The parts that can become weakened easily, are the seams where the straps attach to the bag, and the zipper. If the zipper breaks, then you’re pretty much out of luck as that’s how the bag will close and secure your equipment. If the straps break, you’ll have no way of attaching it to the roof rack, unless you happen to have a spare pair. Have you considered the shape of your new bag? If you haven’t, you should. The shape is going to affect many things. First, is the aerodynamics of your car. This may not sound like a big deal, but it will affect your miles per gallon. If you’re driving long distances or traveling frequently, the extra cost will start to add up. Avoid carriers with poor aerodynamics. The drag it can create at high speeds will create more strain on the straps. This could make them wear down and break faster. Also remember that some bags are designed to fit larger roofs, and if used on a smaller vehicle, it may not fasten properly. Whenever we’re dealing with something on the top of our vehicle, safety should be number one. Stability in this case, is the most important factor. You could have a completely waterproof bag that will hold up to any condition you put it through, but if you can’t safely connect it to your roof, then it shouldn’t be used. If you don’t have a roof rack, make sure you’re selecting a roof top cargo bag that is capable of working without one. In contrast, if you do have a roof rack, also make sure the cargo bag and its straps can properly attach to it. If it comes with a non-slip roof cover, that’s even better in terms of keeping it safe. Every item we selected comes with convenience in mind. You want the bag to be easy to mount on your vehicle, or else you’re probably not going to find yourself using it much. Make sure that it is compatible with your roof in terms of size and whether or not you’ll be using a roof rack. Also, larger bags are often more difficult to mount, and less fastening straps can make things more complicated. As you won’t probably be keeping it on your roof all the time, you’ll need to store it somewhere. Think about how easy it is to fold up and store in your home or even inside the vehicle. There are various accessories you can use along with your new rooftop cargo carrier. Protective roof mats will ensure the bag doesn’t damage the paint of your roof. You can also use a chunk of camping foam too, as long as it isn’t dirty. Extra straps are always useful, and will make sure your adventures go smoothly – even if the included straps aren’t working properly. In some cases, you can also opt for a cargo net. You simply attach the net to the carrier with hooks, which are much easier to use than most straps out there. Also, you may want to consider throwing a step stool in the mix. This will let you easily load and unload your equipment out of the cargo bag. If you’re tall enough or your vehicle is low enough that you can easily reach the roof without it, then that’s even better. If you’re going on a long road trip or traveling through intense weather, then the Shield Jacket Waterproof Roof Top Cargo Bag should be at the top of your list. The 15 cubic feet of extra space you’ll have available for holding equipment will accommodate big and odd-shaped objects with ease. As the name suggests, it will keep your belongings nice and dry in the rain. The double-wall vinyl construction blocks snow, sun, wind and rain. This also ensures sharp objects aren’t going to tear or puncture the waterproof roof bag. One thing you will need is a with this bag is a roof rack. These are typically found on cars, vans, and SUVs, but if yours doesn’t have one, you’ll have to add your own. With 8 built-in straps, securing the bag to your roof will be no trouble at all. If you get confused, simply take a look at the easy-to-follow instructions that will guide your way. When not in use, the bag easily folds down and can be stored just about anywhere! On top of all of that, it’s also an incredibly affordable price! 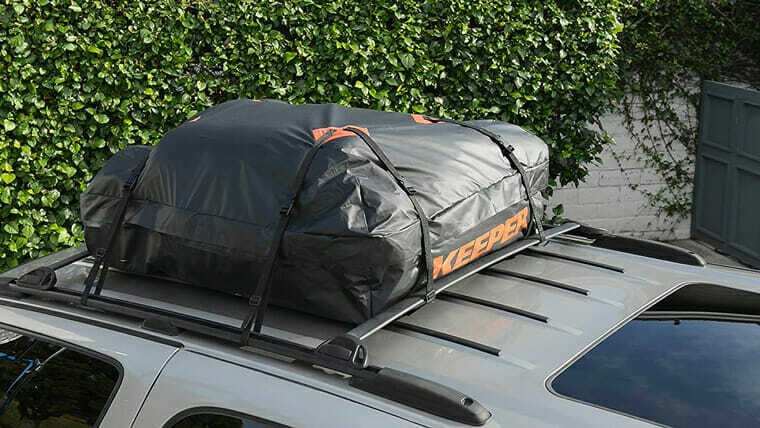 The Keeper Waterproof Roof Top Cargo Bag is a great option if you plan on taking a good amount of equipment with you, or if you need to hold larger objects. The bag provides you with 15 cubic feet of space, which is great to have if you’re a frequent road-tripper. The soft side flex allows it to make room for items of all shapes and sizes, which can be a lifesaver when you’re trying to pack. As you could probably tell by the name, the cargo bag is also waterproof. The vinyl/rubber laminated nylon material protects cargo against road grit, sun, wind, and rain with ease. It’s designed to work with all roof racks that have four-side attachment abilities. It also comes with the straps to attach it to your vehicle, and the included instructions make the process a breeze. When you’re not using it, this product easy to fold and stow away, hardly taking up any room at all. RoofBag is another one of our favorite brands, with their Car Top Carrier. The bag works on bare roofs, cross bars, side rails, and even baskets. This is a stark contrast from the previous product, which could only be used on roof racks. If you select the model that works with roof rails, then it will include heavy-duty straps that can withstand a whopping 3,000 pounds of force that are made to work with rails. The model that can be used without rails also includes straps, but operate differently. This bag is easy to install, and even easier to store as it folds away when not in use. The bag is free of all toxic chemicals and is also fire-resistant, giving you a peace of mind that is always nice to have on a road trip. An aerodynamic shape creates less drag, making for both a quiet and gas-efficient adventure. Being both peel-and-rip-resistant, you can use it in extreme temperatures and weather conditions without worry. If you’re on a budget but still want one of the best waterproof roof bags, then take a look at the Vault Roof Rack Cargo Carrier Storage Roof Bag. It’s one of the most affordable out there, while still staying at the top of the market. With more than 15 cubic feet of storage, you can easily fit extra equipment on the roof of your vehicle. The waterproof bag is made of thick canvas which works to keep out rain and snow. The Velcro works well to keep out water over the zipper closures. The carrier bag works by connecting it to roof bars with ratchet straps/lashing straps. So, which one of these products will be going on your adventures with you? While all of these are great choices, it’s important that it suits your particular needs. For the best overall we recommend the Shield Jacket Waterproof. If you’re looking for a budget buy, the Keeper Waterproof roof top cargo bag is your best bet.